15th Wolverhampton Wanderers (a). 2-0. Noble, Upson. LP:4th. Jack Collison’s father killed in motorcycle accident on the way to watch the Spurs game. ★ 23rd Tottenham (h). 1-2.Cole. LP:11th. 25th Millwall (h). Carling Cup 2nd Rd. 3-1 (aet). Stanislas x 2 (1 pen), Hines. Serious crowd trouble before, during and after this game. FA to investigate! 29th Blackburn Rovers (a) 0-0. West Ham sign striker Alessandro Diamanti from Italian side Livorno. West Ham sign a 32yr old mexican striker, Guillermo Franco on a 1 yr deal. 12th Wigan Athletic (a). 0-1. LP:13th. ★ 19th Liverpool (h). 2-3. Diamanti (pen), Cole. 22th Bolton Wanderers (a). Carling Cup 3rd Rd. 1-3 aet. Cole. ★ 26th Manchester City (a). 1-3. Cole. ✈ 04th Fulham (h). 2-2. LP:19th. Cole, Stanislas. 17th Stoke City (a). 1-1. Upson. ★ 24th Arsenal (h). 2-2. Cole, Diamanti (pen). 2-0 down at half time... still 2nd from bottom! 31st Sunderland (a). 2-2. Franco, Cole. 2-0 up at half time... joint bottom! 04th Aston Villa (h) 2-1. Noble (pen). Hines. Green saves a penalty and Hines gets the winner in injury time! Alan Curbishley wins his case for wrongful dismissal against West Ham. 08th Everton (h). 1-2. Own goal. 21st Hull City (a). 3-3. Franco, Collison, Da Costa. 2-0 up after 16 minutes... 3-2 down after 20! Out of bottom 3! 28th Burnley (h). 5-3. Collison, Stanislas, Cole (pen), Franco, Jimenez (pen). LP:17th. 5-0 up after 70 minutes, fortunately the Burnley come back started late. ★ 05th Manchester Utd (h). 0-4. 12th Birmingham City (a). 0-1. 15th Bolton Wanderers (h). 1-3. Diamanti. ★ 20th Chelsea (h) 1-1. Diamanti (pen). LP:19th. 26th Portsmouth (h). 2-0. Diamanti (pen), Kovac. ★ 28th Tottenham (a). 0-2. ★ 03rd Arsenal (h). FA Cup 3rd Rd. 1-2. Diamanti. West Ham are finally bought by Sullivan and Gold. ★ 17th Aston Villa (a). 0.0. 30th Blackburn Rovers (h). 0-0. 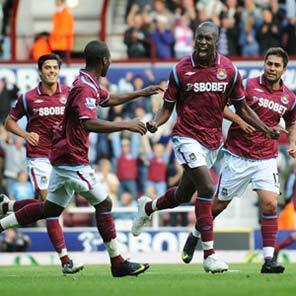 On the final day of the transfer window, West Ham acquire strikers Benni McCarthy, Mido and Ilan! 06th Burnley (a). 1-2. Ilan. New club owners announce that West Ham are in dire financial trouble. Everyone at the club will need to take a 25% pay cut at the end of the season! ★ 10th Birmingham City (h). 2-0. Diamanti, Cole. LP:14th. 20th Hull City (h). 3-0. Behrami, Cole, Faubert. ★ 27th Manchester Utd (a). 0-3. LP:13th. 06th Bolton Wanderers (h). 1-2. Diamanti. ★ 13th Chelsea (a). 1-4. Parker. LP: 16th. ★ 20th Arsenal (a). 0-2. ★ 23rd Wolves (h). 1-3. Franco. 27th Stoke City (h). 0-1. ★ 04th Everton (a). 2-2. Da Costa, Ilan. ★ 10th Sunderland (h). 1-0. Ilan. LP:16th. ★ 17th Liverpool (a). 0-3. 24th Wigan Athletic (h). 3-1. Cole, Kovac, Parker. 01st Fulham (a). 2-3. Cole, Franco. A so ends a season to forget! 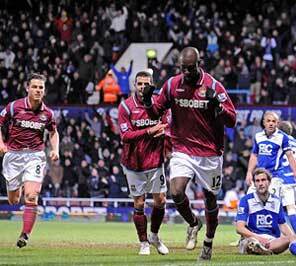 11 x Carlton Cole (Pen x 1, Carling Cup x 1). 8 x Alessandro Diamanti (Pen x 4). 4 x Junior Stanislas (Carling Cup x 2, 1 x Pen). 2 x Manuel Da Costa. 2 x Zevon Hines (Carling Cup x 1). 2 x Mark Noble (Pen x 1). 1 x Louis Boa Morte.